What do you do when your town is named after a famous heroine? You build the largest, tackiest replica of her that you possibly can. The town of Pocahontas didn’t disappoint with their Pocahontas. I’m sure that Native Americans somewhere are protesting this poorly reproduced image of one of their great heroines. However, she has all of the makings of a really great Roadside Attraction. She’s in a weird position, not holding anything and yet not pointing to anything. This makes for great photo opportunities of you posing like the attraction. 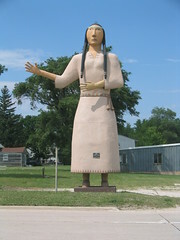 Built in 1954 and standing 25 feet tall Pocahontas is still lovingly maintained by the family who made her. She’s a proud figure of Roadside America that is worth the detour.